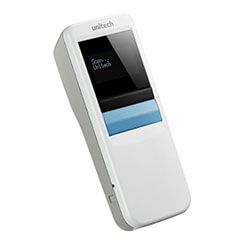 The new MS916 Wireless Pocket Laser Scanner is part of Unitech’s latest generation of advanced handheld barcode readers. This pocket-sized scanner offers several outstanding features. The MS916 provides mobile workers a user-friendly three-button operation that is very easy to use and requiring no special training. Its bright 1-inch OLED display is easy to read and provides feedback of the scanned information to reduce errors. This scanner supports real-time data transmission and the 128 x 64 resolution display makes it easy for the user to configure the scanner. Through its wireless technology, the MS916 connects quickly and easily to virtually any laptop, tablet or smart phone (Windows, Android or Apple iOS). The MS916 can operate at distances up to 30-feet in open space.